Dementia Australia (QLD) offers a range of services for people with dementia, family carers, industry workers and anyone who wants to know more about memory loss, dementia or good brain health. 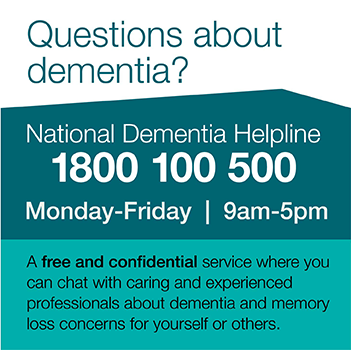 National Dementia Helpline 1800 100 500 offers information and support from trained advisors. About Dementia is a resource that lists our services in Queensland, you can also order a hard copy through the National Dementia Helpline. Free Community Education a wide range of topics for people interested in dementia, memory and healthy ageing throughout Queensland. Training Programs a range of specialised courses with nationally recognised qualifications for industry workers. Support Groups a varied program of support groups and free activities for people living with Dementia, their carers and family. Support for families and carers providing free counseling, information and support for people with dementia, their carers and family. Living with Younger Onset Dementia is designed specifically for people in the early stages of dementia who have been diagnosed aged 65 years and under. This is their opportunity to share their experiences or feelings with others in the same situation. Participants are able to bring a carer, family member or friend with them if they like. Friendship Clubs held in various areas, a social engagement group for the person living with dementia and their care partner. This includes quarterly attendance by a Dementia Australia facilitator. Therapeutic Activities aiming to support and empower people living with dementia through social engagement, learning new skills and healthy living. Counseling: Dementia Australia (Qld) provides free one-on-one counseling sessions for people affected by a diagnosis of dementia, including the person with dementia, their families and carers. Information Sessions: Dementia Australia (Qld) offers special sessions throughout the year which provide a simple easy to understand introduction to dementia.